Fancy Opal and Diamond band. 14k Gold Opal band features a bead blast finish with polished accents creating a sophisticated design. 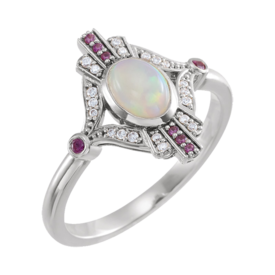 Center Ethiopian Opal is 7x5mm and accent diamonds total .05ctw. Ring measures about 8.4mm across the top and tapers down to 2.5mm at the base. Shown in 14k Yellow gold also available in 14k White or Rose gold. 14k Rose Gold Opal, Sapphire, and diamond ring. 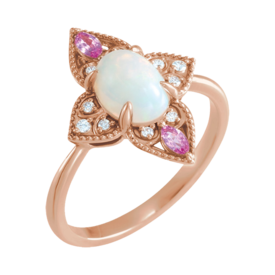 Beautiful Vintage style ring is set with an 8x6mm oval Opal and accented with pink Sapphires and 1/8ctw diamonds. 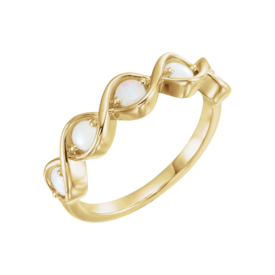 Buy this beautiful ring unique made to order ring in 14k White, Yellow, or Rose gold. Pretty 14k Gold Opal Stackable band. Genuine Opals each measure 3mm round and there are 5 stones in this ring. Ring measures 5.2mm wide across the top and weighs 3.84grams. 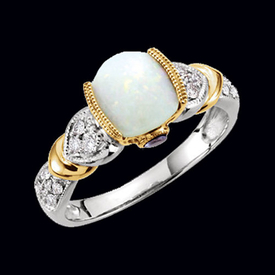 Beautiful 14k Yellow Gold Opal and Diamond ring. Genuine White Ethiopian Opal measures 8x6mm oval and is surround in a halo of 3/8ctw diamonds. Same design also available with a Pink Coral center, or a Turquoise center. Check out the video. Fiery 14k Gold Opal ring. 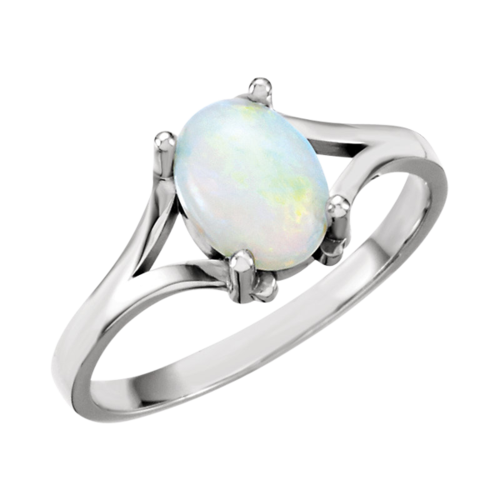 Our simple design Opal ring features a large 8x6mm genuine Australian Opal. Ring is available in 14k white or yellow gold. 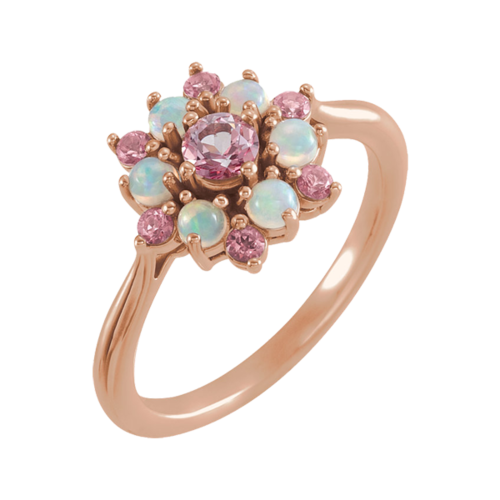 Vibrant 14k gold Opal and diamond cluster ring. 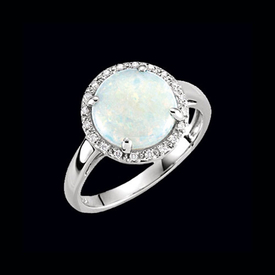 Featured Opal measures 7x5mm oval and is accented with 1/5ctw diamonds. This design is available in 14k White, Yellow, or Rose gold. This ring should ship out in 4-6 business days. Additional time required for the 14k White gold, up to 18 business days at this time. 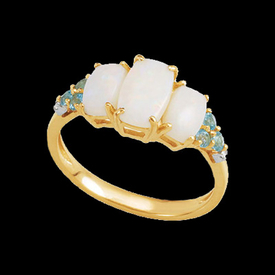 Lovely 14k Gold Opal and Diamond bubble border ring. This great design is available in 14k White, Yellow, or Rose gold. Diamonds surround the Genuine Opal center and total 1/6ctw. Opal is an Australian 8x6 oval gemstone. This ring weighs about 5.93grams. Pretty 14k gold Opal ring. Genuine Opal measures 7x5mm oval and is accented with dainty diamonds either side. A very pretty ring. 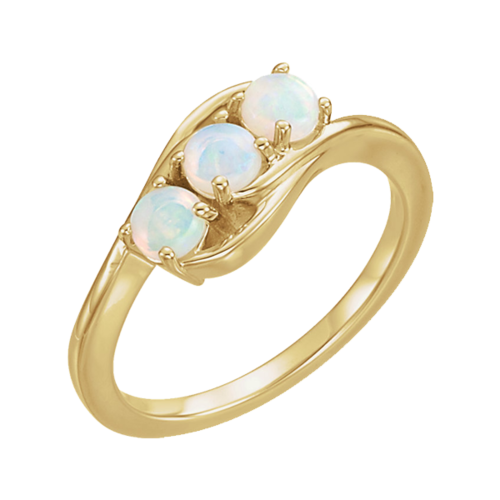 Beautiful 14k gold 3 stone Opal ring. Order this in 14k yellow, white, rose gold or Platinum. Each genuine round Opal measures 4mm round and they are AAA quality. This ring is 13.4mm long across the top and very thin, about 1.7mm wide at the base. Very pretty ring. 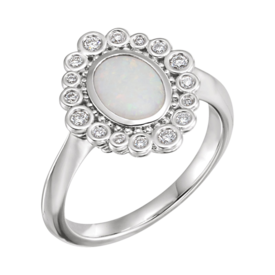 Sporty design 14k white gold genuine opal and diamond ring. Genuine opal is a cushion cut cabochon that measures 8x8mm and is a 1.34 carat stone. Channel set diamonds are .03 ctw and are a pleasant accent. Opal jewelry makes a great gift. 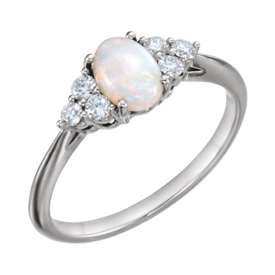 For centuries Opals have been thought of as gems that ward off evil and ill health. Gorgeous 14k Gold Genuine Opal, Tanzanite, and Diamond ring. Pretty design features heart shapes on either side of the center 7x7mm opal. Tanzanite are set below the center opal on either side and yellow gold accents add pizazz to this great design. Diamonds total 1/6ctw in this ring. 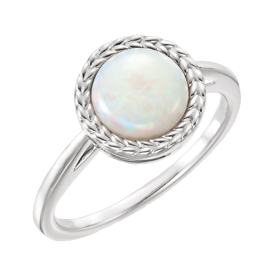 You will Love this opal ring. 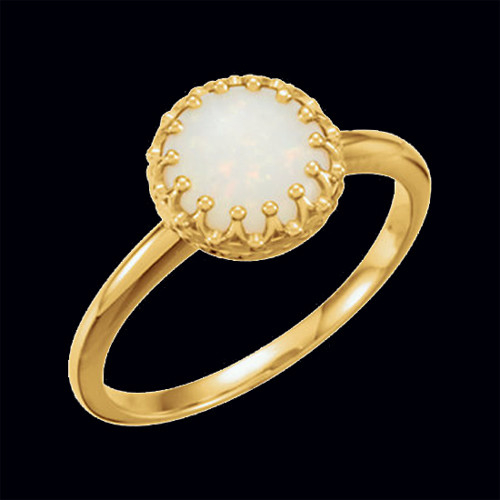 Gold crown design gemstone ring. This simple old world style ring is available in a large variety of customizations. Center stone is 8mm or 10mm round depending on the stone selection. 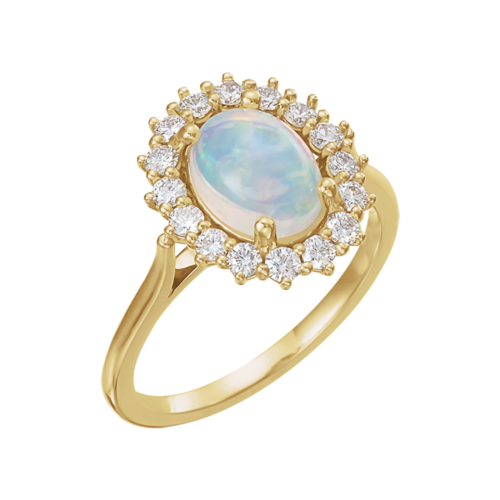 Shown in 14k yellow with an Opal center, also available with Amethyst, Blue Chalcedony, Chrysoprase, London Blue Topaz, or Rhodolite Garnet. Available in 14k yellow, white, and some selections in rose gold. Email for pricing on this ring set in Platinum. Pretty 14k White gold Opal and diamond ring. Genuine Opal is a 2ctw gemstone and measures 10mm round. Accent diamonds total .07ct and are a vibrant border. If you love the brilliance of Opal, you'll want to pick this ring up today. 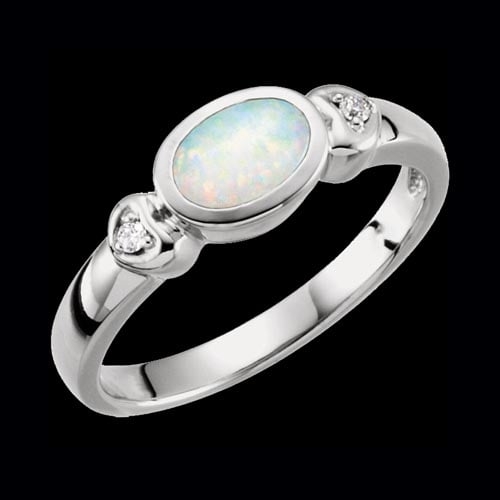 Lovely Australian Opal set in 14k white gold surrounded with diamonds. Opal is an A quality gemstone and measures a bold 10x8mm. Diamonds total .06ctw and are great accents to the beautiful Opal. Stock size 7. Genuine Opal, Swiss blue topaz, and diamond ring. 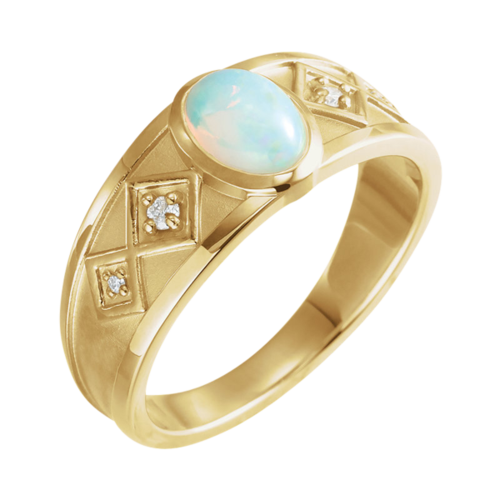 Genuine opals set in 14k yellow gold with beautiful swiss blue topaz accents on either side then finished with a diamond create this beautiful opal ring. Free ring sizing. Gorgeous 14k Gold Genuine Opal, Pink Tourmaline, and Diamond ring. Opal measures a large 10x8mm, beautiful pink tourmaline are set under the opal on either side. Diamonds total 1/6cttw. 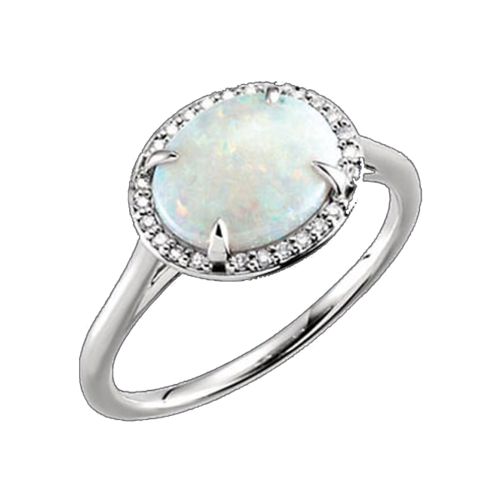 You will Love this opal ring.